The website www.tamimi.com is operated by Al Tamimi & Company Limited (DIFC Commercial Licence No. 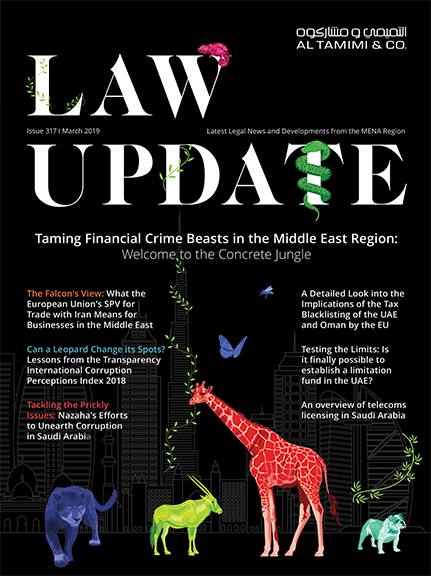 CL0155 of Building 4, 6th Floor, Dubai International Financial Centre, Dubai, United Arab Emirates; “Al Tamimi & Company”, “we”, “us”, “our”), for and on behalf of the various entities operating as part of the Al Tamimi law firm across the Middle East, as further specified here. Al Tamimi & Company is the data controller of any personal information provided to us, via this website or otherwise. Al Tamimi & Company is committed to respecting your privacy. In this privacy notice, we describe how we collect and use your personal information, and the rights you have in relation to such information. We may collect personal information from you through your use of the website, when you request information from us, when you engage us for legal services, or as a result of your relationship with any of our clients. We may request, and collect from you, personal information and other information. Depending on the information or services you request, we may ask you to provide your name, phone numbers, address, email address, passport details, and other such personal information. By providing us with any personal information, you are consenting to the use of your personal information as contemplated in this privacy notice. If you do not want us to use your personal information for any of these purposes, please do not provide us with your personal information. We seek to retain your personal information only for as long as is reasonably necessary for the purposes for which it was collected – or as otherwise required by applicable law. (e) where otherwise required by law. If we re-organise our business, we may need to transfer your personal information to other group entities or to third parties. If you would like to cease receiving marketing materials from us at any time, please let our CRM management team know directly. You can also change your preferences for receiving our marketing emails and legal updates from us at any time, and you can unsubscribe by following the instructions specified in our marketing emails or via the websites. Please update your details via this link, or otherwise contact our CRM management team by email at ctg@tamimi.com. We may disclose your personal information to a recipient (i) for the purposes of outsourcing one or more of the purposes-related functions described above; (ii) to confirm or update information provided by you; (iii) to inform you of events, information about our services, and other important information, or (iv) for other purposes disclosed at or before the time the information is collected. If you tell us you wish to attend an event, your name and organization may appear on a list which we provide to other delegates at the event. We also take photographs and video of our events, and this may result in your image being captured and used in the course of reporting on the event (e.g. via social media or other means). In relation to any other third parties we will only disclose your information where you have given your consent or where we are required to do so by law, or where it is necessary for the purpose of, or in connection with legal proceedings or in order to exercise or defend legal rights. It may sometimes be necessary for us to share your personal information with other Al Tamimi offices around the Middle East region (currently, in Bahrain, Egypt, Iraq, Jordan, Kuwait, Oman, Qatar, Saudi Arabia and the United Arab Emirates) – or for such Al Tamimi offices to share your information with Al Tamimi & Company in the DIFC. It may also be necessary for us to share your personal information with associated professional services firms around the world, who provide services to us or on our behalf. This will entail a transfer of personal information from within the Dubai International Financial Centre to recipients outside the DIFC, and vice versa. The level of personal information protection in locations outside DIFC may be less than that offered within the DIFC or the country in which you reside and may not be recognized as providing an adequate level of protection, but we have procedures in place to ensure the protection of personal information. These procedures include putting steps in place to ensure that all such entities keep your personal information confidential and secure and only use it for the purposes that we have specified and communicated to you. When we transfer your information to other countries, we will use, share and safeguard that information as described in this privacy notice. We only transfer personal information to these countries, with your consent, when it is necessary for the services we provide you, or subject to appropriate safeguards that assure the protection of your personal information, such as standard contractual clauses. f. Withdraw consent: when personal information is processed on the basis of consent an individual may withdraw consent at any time. In the event that you no longer want to receive any marketing material from us, please use the unsubscribe option (which is in all of our marketing emails to you), or contact us on the details set out below. If you would like to exercise any of the above rights, please contact us at compliance@tamimi.com. The information you provide may be confidential, and we will maintain such confidentiality and protect your information in accordance with this privacy notice, our professional obligations and applicable law. We do not sell, rent, distribute, or otherwise make, personal information commercially available to any third party. We may share information with our service providers for the purposes set out in this privacy notice. We have implemented reasonable administrative, technical and physical measures to protect your personal information against loss, misuse and alteration. Specifically, we use Google Analytics, and other similar products to track unique visitors to our website (storing a unique visitor ID, the date and time of first visit, the time their current visit started and the total number of visits they have made); to register session details (so as to attribute visit information, including conversions and transactions to a traffic source); and to register that a website visit has ended and the browser closed. Most internet browsers have a mechanism notifying you when you receive a new cookie, and telling you how to reject new cookies or disable cookies altogether (if you wish to do so). We may change this privacy notice from time to time, and your continued use of this website or our services indicates your consent to the changes to the privacy notice. We will re-date the notice to show when there were any material changes. If you have any questions about this privacy notice, or our processing of your personal information, please contact us on compliance@tamimi.com.